The vote was 7-3 — the first time in 5 meetings that the nation’s Central Bank was non-unanimous and the first time since 1992 that the FOMC adjourned with as many as three dissenters. The Fed also noted that the housing sector remains depressed. On the positive side, the Fed said that business investment in equipment and software continues to expand, and that energy costs have dropped and no longer contribute to inflationary pressures on the economy. In fact, the Fed worries that inflation may be running too low for the country’s good. To that end, the Federal Reserve has pledged to keep the Fed Funds Rate in its current range near 0.000 percent “at least until mid-2013”. This is a departure from prior statements in which the Fed gave no such date. Mortgage market reaction to the FOMC statement has been positive this afternoon. Mortgage rates in TN are improving, but note that sentiment can shift quickly — especially in a market as uncertain as this one. If today’s mortgage rates look good in your household budget, consider locking in a rate. 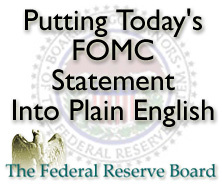 The FOMC’s next scheduled meeting is September 20, 2011.